Hi There ! I am trying to connect to my local RTMP server in order to use some video cameras ... but it takes too long and doesn't connect to Rtmp server. I think its an timeout error or maybe an problem with Flv codecs. How does Wirecast logs behind the scendes ? Perhaps I could analyze what's going on ... since I only have "Cant connect to the uri". Thanks In advance. Are you able to connect using VLC. I personally try that first. Maybe it needs credentials if you don't expect it to. What kind of cam is it and what RTMP Server do you use. Jens Jarke Hi Thanks! Yes I Can connect on VLC .. works perfectly ... but nothing happened when I set it up on WC. Jens Jarke I am using Logitech c270 and Nginx Rtmp server. Diego Liñayo It's also possible you need to identify the port in the URL link. Perhaps port 1935. Perhaps Stream Options and Forman Options are set to Auto Detect and that's not working. You can set those manually instead. Perhaps it's the codec in the FLV container. Perhaps it's the old VP6 codec instead of H.264 for example. CraigS I found the problem. I just stream video .. after attach an audio interface it works. But ... I would like to know how should attach the web stream source without audio. Diego Liñayo Wirecast will see both audio and video as they are muxed. 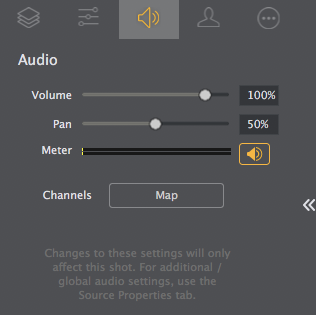 You can always lower the volume on the Master Layer shot in the Audio tab. 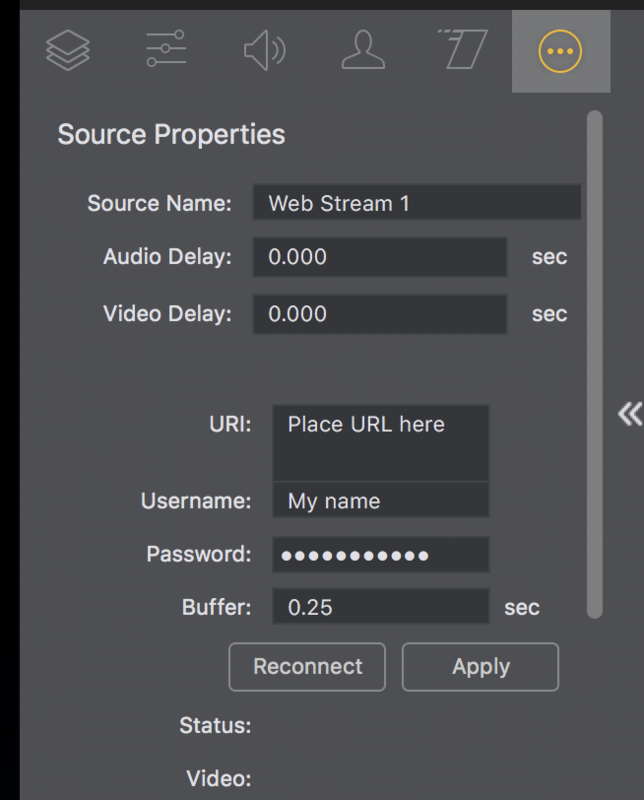 CraigS Good morning, Is there a new much simpler way to ingest an RTMP live feed into Wirecast 12 without having to dance around with VLC and other mediums? Darrian Dority RTMP should work with Wirecast WebStream otherwise you would send to a server like Wowza and ingest that output. I'm not sure what you're looking for. RTMP can be direct or RTMP may require a server. It depends on the source. CraigS I'm looking to take a live feed into Wirecast and have volume control. I have an RTMP feed and protocols. When I input the address into the URL area, it doesn't permit the insertion on username, although the box is present. RTMP has two primary methods of transport- Push, where a streaming encoder delivers the RTMP to a RTMP Server, and Pull where the client retrieves the stream and plays it back. ... RTMP Pull, while it's still the same protocol, uses a slightly different process. Wirecast only supports RTMP pull. If your RTMP source only supports RTMP push, you will need to use something else in between to act as a proxy. This functionality has been requested to Telestream, and is documented in the community tracker in this link. If you support this feature, please go to the tracker and vote. Also, submit a ticket to the official support team and reference that you also require WIRE-14424 to be implemented. Please explain. It works for me even without a real URL. I just typed directly into it. Developers would like to see more requests for this to raise the priority. CraigS on our Win 10 computer with Wirecast 12, we can not type in the username as it appears to be a shared box with the URL. Even if you attempt to not input the URL and tab down to the username area, it will not allow you to do so. CraigS ok. with that being said and understood, how do you gain control over audio if you input a web page? I have tried this as a work around and can see the media asset in question, but have zero audio controls on the preview or post side, but I can hear it loud and clear. Even when the asset is not selected as preview or live, that asset is still playing it's audio with no perceivable control over it besides closing the program. I have no problem on my Windows 10 computer. The entry fields are small and Username is very close to URI box (UI issue we're examining) but I can certainly enter info in those areas. Can you make a screen recording so I can see what you're doing? how do you gain control over audio if you input a web page? Web Page doesn't work with audio. You'd want to capture system sound (Wirecast Screen Capture can to that), try System Audio Capture as a source or, use virtual audio cable type software. Keep in mind with System Audio Capture you'd also pick up any other audio coming from the computer. Virtual audio cable software could avoid that. CraigS I just put the cursor at the very bottom of the username box and was able to find a happy spot for the insertion allowance. Once I did that, I am still getting the rejection. I have been on with Robert and Sandy to resolve this as well. Darrian Dority Perhaps there's an account specific issue. Try creating a New User Admin account and testing there. If it still happens in the new account that would at least confirm it's a system related issue. Can you use the Text fields for our Overylays > Text feature? Once I did that, I am still getting the rejection. I have been on with Robert and Sandy to resolve this as well. Can you post the case number? Do try creating a new user admin account since it may confirm an account or system based issue. CraigS btw, what happened to the NDI options in 12. I do not see them? Thanks for confirming that. Seems there's a system related issue.